WEST LAFAYETTE, Ind. — Chemical engineers at Purdue University have developed a new method to process agricultural waste and other biomass into biofuels, and they are proposing the creation of mobile processing plants that would rove the Midwest to produce the fuels. “What’s important is that you can process all kinds of available biomass — wood chips, switch grass, corn stover, rice husks, wheat straw …,” said Rakesh Agrawal, the Winthrop E. Stone Distinguished Professor of Chemical Engineering. The approach sidesteps a fundamental economic hurdle in biofuels: transportation of the biomass. Transporting biomass is expensive because of its bulk volume, whereas liquid fuel from biomass is far more economical to transport, he said. The new method, called fast-hydropyrolysis-hydrodeoxygenation, works by adding hydrogen into the biomass-processing reactor. The hydrogen for the mobile plants would be derived from natural gas or the biomass itself. However, Agrawal envisions the future use of solar power to produce the hydrogen by splitting water, making the new technology entirely renewable. The method, which has the shortened moniker of H2Bioil (pronounced H Two Bio Oil) has been studied extensively through modeling, and experiments are under way at Purdue to validate the concept. Findings are detailed in a research paper appearing online in June in the journal Environmental Science & Technology. The paper was written by former chemical engineering doctoral student Navneet R. Singh, Agrawal, chemical engineering professor Fabio H. Ribeiro and W. Nicholas Delgass, the Maxine Spencer Nichols Professor of Chemical Engineering. 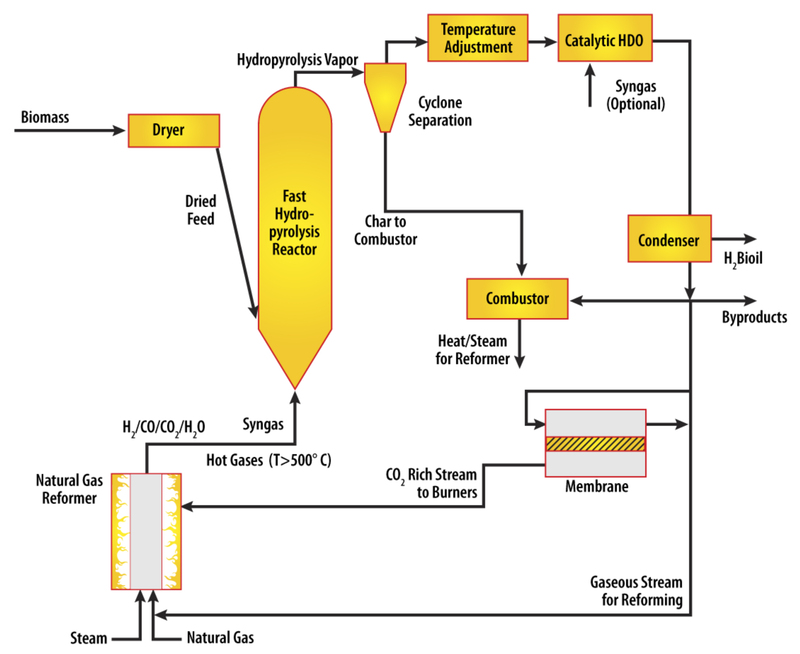 The Environmental Science & Technology paper outlines the process, showing how a portion of the biomass is used as a source of hydrogen to convert the remaining biomass to liquid fuel. “Another major thrust of this research is to provide guidelines on the potential liquid-fuel yield from various self-contained processes and augmented processes, where part of the energy comes from non-biomass sources such as solar energy and fossil fuel such as natural gas,” said Singh, who is now a researcher working at Bayer CropScience. The new method would produce about twice as much biofuel as current technologies when hydrogen is derived from natural gas and 1.5 times the liquid fuel when hydrogen is derived from a portion of the biomass itself. 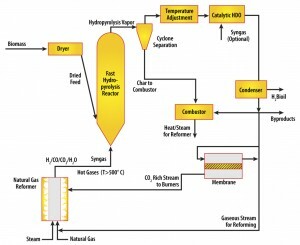 Biomass along with hydrogen will be fed into a high-pressure reactor and subjected to extremely fast heating, rising to as hot as 500 degrees Celsius, or more than 900 degrees Fahrenheit in less than a second. The hydrogen containing gas is to be produced by “reforming” natural gas, with the hot exhaust directly fed into the biomass reactor. Purdue has filed a patent application on the method. The general concept of combining biomass and carbon-free hydrogen to increase the liquid fuel yield has been pioneered at Purdue. The researchers previously invented an approach called a “hybrid hydrogen-carbon process,” or H2CAR. Both H2CAR and H2Bioil use additional hydrogen to boost the liquid-fuel yield. However, H2Bioil is more economical and mobile than H2CAR, Singh said. The research was funded by the U.S. Department of Energy, the National Science Foundation and the U.S. Air Force Office of Scientific Research, and is affiliated with the Energy Center at Purdue’s Discovery Park. We are intersted to know if biomass to liquid fuel technologu has been fully developed amd is it possible to buy/set up a small plant for commercial purpose. kindly contact by mail if any body can offer this technology.